London - Two mysterious masked men, identifying themselves as independent and concerned citizens who fancy themselves as crimefighters, stepped forward today taking credit for thwarting last week's plot to blow up airliners en route from London to the United States. Referring to themselves as Ketchup Man and Ketchup Boy, the two men claimed it was their efforts that tipped off authorities in the UK, Pakistan and the U.S. to the budding terrorist plot. "I had a plan," said Ketchup Man to a room full of anxious reporters and press. "I can't tell you the details of my plan, it's a Super-Duper Top Secret Plan. And I'm proud to say that my plan worked. My plan was to catch these bad guys and we did just that." "You tell 'em, Ketchup Man," said Ketchup Boy. Ketchup Man and Ketchup Boy; Are They Actually John Kerry and John Edwards? "Easy there, Ketchup Boy. We don't want to gloat." Reporters shouted, "Who are you?" "It's best for everyone if our identities remain unknown," said Ketchup Man. One reporter shouted, "You sound just like John Kerry and John Edwards." "We, ah...we, ah.... WHO? No, we're not those people," replied Ketchup Man, in an obvious and ineffective attempt to deny the accusation. "We're not familiar with those names," added Ketchup Boy. "Ketchup Boy is right! We must go now," said Ketchup Man as he and Ketchup Boy left the room and building. The phrase, "To The Ketchup Cave," was heard as they left for places unknown. "Who were those masked men," is what reporters muttered to themselves. A brave reporter ventured an answer, "Isn't it obvious it's John Kerry and John Edwards?" "Oooooooooooh.......," was the collective reply. Simply twisted. David you are not well. Go back to your room. The meds will kick in soon. If Ketchup Man decides to reappear with election aspirations I have no doubt that he and his Ketchup Boy du Jour will find a way to link themselves to a positve anti-terrorist act. There won't be any concrete evidence that supports their link but that won't stop them from declaring how wonderfully effective they were at stopping terrorism. Hey...I'm just reporting the news and events that really happen.....and how do you know the med's haven't kicked in, huh?!? Can I blame it all on being awake past 3AM and watching the Cartoon Network? I agree with your analysis of KM and KB. I'm certain KM will run in '08. 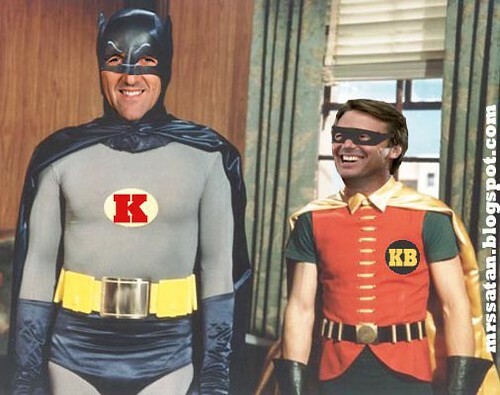 I think KB may, but I don't think he's as passionate about it as KM!